One of the few official trails in the Mojave National Preserve, the 2 mile path to the top of 5,627 foot Teutonia Peak makes for an enjoyable half day hike, at first crossing a field of Joshua trees intermingled with other interesting yucca and cacti, then passing spoil heaps and shafts from an old silver mine, before ending with a 500 foot climb to the rocky summit, from where a fine view stretches in all directions, across many square miles of the Mojave Desert. The round trip takes about 2 hours, the path is firm and well marked, and all the surroundings are very peaceful and unspoilt. 10 views of cacti and yucca along the trail. 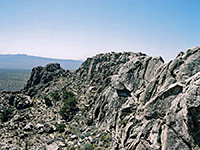 Panorama from the ridge near the top of Teutonia Peak. 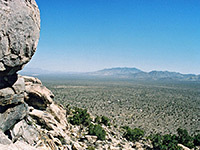 The signposted trailhead is one third of the way along the road from Cima to interstate 15, on the west side of the highway - opposite a distinctive monzonite slickrock outcrop and 1.7 miles north of Kessler Springs Ranch. 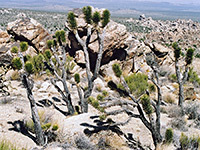 Beside the layby is an information board about Joshua trees, from where the straight path (once used by vehicles) sets out in a southwesterly direction, entering a medium density Joshua forest, the yucca (here up to 25 feet tall) mixed with bitterbrush, creosote bush, echinocereus, cholla and several other species of opuntia. The ground is covered by coarse sand, strewn with rounded granite boulders and crossed by shallow dry washes. The path crosses another old track, remaining almost level, as it approaches the side of the mountain, bending away just before the first slopes and reaching the remains of Teutonia Mine, where small amounts of silver ore were excavated at the start of the 20th century. The site of the mine is evident from a number of shallow pits, two open but fenced-off shafts and several colorful tailings piles. 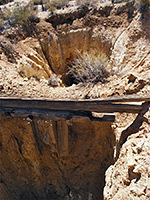 The trail narrows to a regular footpath, crosses a third old mining track, turns southeast, then starts to ascend the hillside, up not too steeply to the top of a ridge, and the first view of volcanic Cima Dome one mile further west. The terrain is now quite rocky, still bearing some Joshua trees though now the most conspicuous plant is the yellow-spined opuntia chloratica, which forms huge clumps of 100 or more pads. The cairned trail follows the ridge, still climbing but more gently now, and ends at a high point between several vertical-sided granite outcrops; the actual summit is not well defined but the path approaches close enough. A little bit of moderately difficult rock climbing would be needed to reach the very top. Because of the cliffs and boulders the views are not quite 360° though still very wide ranging, taking in Baker and Cima Dome in the west, north to the Ivanpah Mountains, and east to Kessler Peak and Ivanpah Valley.